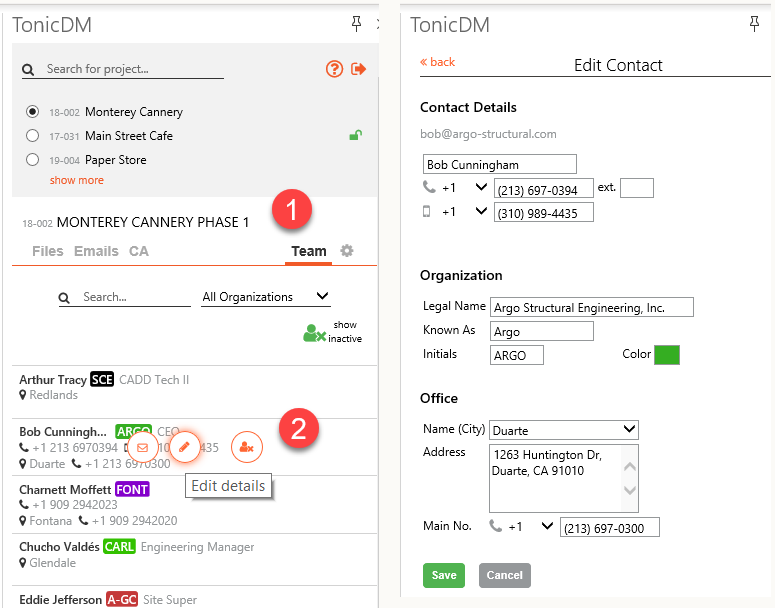 Ideas about design and information management along with new features and updates to the TonicDM product. Editing contacts in the TonicDM Outlook sidebar is quick and easy. On the Team tab for your project, hover over contact. Click the email icon to send them an email. Click the pencil icon to edit the contact details. A page will open allowing you to enter new contact information. This updates the contact for your entire organization, not just this one project. Clicking the person-x icon will de-activate the contact on this project. This is how you should remove people who don’t need to be listed on the project team. Many firms have projects that not all staff should have access to. This could be because of an NDA or confidentiality agreement signed with a client, or it could be a “project” set up for an internal department like HR or accounting. In these situations you now have the ability in TonicDM to lock the project. Locked projects can only be accessed by active team members: by controlling who is active on the team, you can control who has access to the project. The “Lock” setting is an option in the Project Settings. This setting can only be changed by your TonicDM Administrators or by TonicDM Support. a red locked symbol, meaning the person is not an active team member and therefore cannot access this project. a green unlocked symbol, meaning the project is locked but the person is an active team member and therefore has access to it. 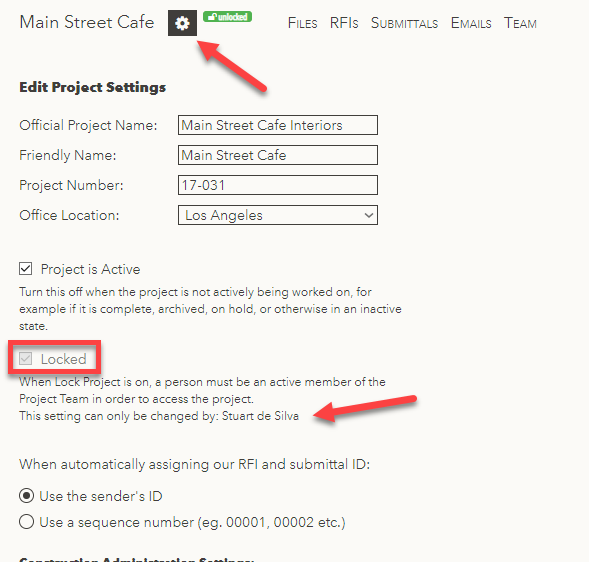 If the project is not locked, no symbol is shown, and anyone in your organization can access the project. This webinar recording will give you a good introduction to how Tonic DM can be used within your organization. Many people approach us looking for an alternative to Newforma Project Center. In this webinar we show the ways Tonic DM and Newforma are similar and the ways they are different. Whether you’re preparing to whip your firm’s information into shape, or you currently have Newforma Project Center infrastructure but would like to know what’s out in the market, this webinar will help you compare solutions from a practical point of view. We’ve cleaned up some visuals in the Outlook sidebar to make things a bit more streamlined. Filing emails one by one isn’t practical for large sets of email. Our new "folder filing" feature lets you drag any number of emails to a folder in Outlook and have them filed automatically. When reviewing project correspondence in TonicDM, you may be interested to see the emails that you weren't involved in. This is particularly helpful if you manage a lot of projects and need to keep yourself up to date. Select "Not To Me" from the filter selector in the Outlook Sidebar. Sometimes you'll need to forward or reply to an email that has been filed in TonicDM. To reopen the message in Outlook, open the message in TonicDM and click Download Original Message. Each project can have one or more project executives. If you are a project executive you have the option to mark email that you file for that project as confidential. With Azure Active Directory (AAD) integration turned on your staff can use TonicDM without manually setting up an account or remembering another password! Instead they can log into TonicDM using their corporate username and password. To make it faster to select team members when sending out files, RFIs or submittals, we've added a sidebar that shows the project Team List. The sidebar is on the right of pages that involve sending items. You may need to slide it open by clicking the arrow. Clicking "To" or "CC" in the sidebar adds that person to the distribution list. Emails that have no external recipients are now automatically marked with the flag "Internal". This lets you quickly know whether an email involved only staff from your own company or has implications externally to your firm. Emails are categorized automatically. No input is required for this. To view internal emails, use the filter under "All Organizations". Copy-typing incoming RFIs and submittals into your firm's system is no fun. Now you can populate the TonicDM incoming RFI and submittal forms from your GC's notification email.